The Crystal Set seen from below - it is not much here! 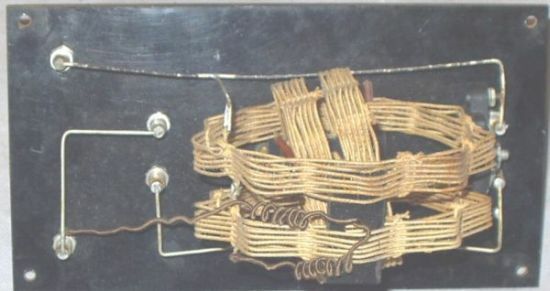 A variable coil (43,7-140µH) and a 2000cm (2,2nF) decoupling capacitor to the right. Circuit diagram for the crystal set, just three components. More or less hidden features for BC-receivers. The hidden Q-multiplier. Some pieces of equipment have obscure details which solved the problem on the production line or is just a hidden improvement. Later versions of Radionette Kurér portable receivers (DK96/1AB6, DF96/1AJ4, DAF96/1AH5, DL96/3C4) have positive feedback in the IF, no notice has been found in any of the circuit diagrams, they are available at www.nrhf.no. The drawing shows how to find the modification, in my receiver the thin wire was covered with red pvc instead of blue as for Stein Torp. The original circuit shows no feedback. The +85side of the second IF transformer (coil MFC of transformer 2014A) goes via a one turn link on to the first IF transformer (coil MFB of transformer 2269) to +85v. The IF transformers are probably of English manufacture (Salford Electrical Instruments Ltd) and have very high Q (at least Q=200) compared to standard types, see the note below. 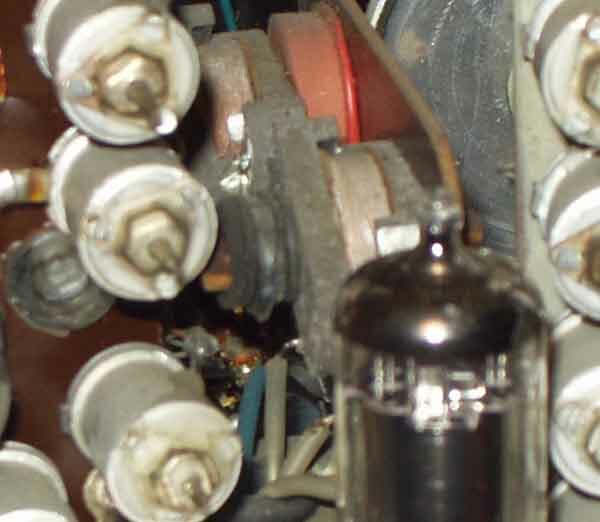 The actual receiver with the feedback winding visible as a red covered wire around the inner coil of the IF coil (behind DF96 IF-amplifier valve). Component values: .039=39k, .25=250nF. This receiver has s/n: 688 539. Have also an older model receiver with DK92/1AC6 mixer valve, s/n 388 901, but it hasn't this modification. The not-so-hidden-circuit (Q-multiplier) and other applications. On the other hand, Stein Torp (LA7MI) notes that a similar circuit is documented for Radionette 'Menuett' model 1954 (S/N above nr 497 001) [NRHF cct 54RN1S 8-89 - either versions]. The circuit diagram shows a second link from anode circuit of the IF amplifier (EBF80/6N8) on to the first IF transformer (T216) while output from the EBF80 amplifier goes to T217. Some improved selectivity seems to have been an advantage, but it is later abandomed, when the main feature is FM reception while AM is more or less forgotten. David Andersen type 561 (562) portable radios (dated 1956). In this receiver's IF amplifier is used the more modern valve DF97 (1AN5) with available suppressor grid connection. The positive feedback is put back into the suppressor grid instead of control grid. More applications with positive IF feedback. Q-multipliers have been used in many receivers where the selectivity of early models might have shown some room for improvement. Telefunken Spez. 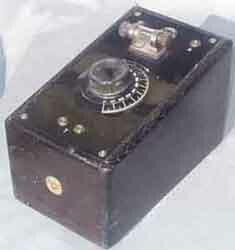 801 from 1936, were modified after a year or two to include a multiplier, possibly based on published circuit from ARRL handbook, see page 17t. He also mentions that more or less invisible Q-multipliers may have been more widely applied than we would first believe. 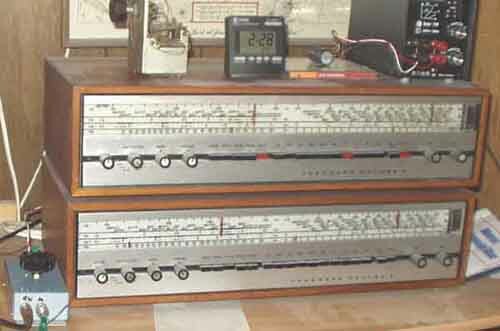 Max Funke "Mikrohet" receiver from 1961 has a positive feedback to improve the ECC85/6AQ8 mixer, and we found FM-tuners using ECC85 which have positive feedback (neutralizing) for 10,7MHz to improve the Q-factor and stability. In FM tuners (with BF200 and 2x BF195) for Radionette and Tandberg products from around 1971 it is a notch-circuit (C119/L103) between emitter/base of the mixer transistor, it is probably tuned to 10,7MHz to provide proper termination (short-circuit) on the input port for all other frequencies than the RF and LO. According the circuit diagram for these two makes the same FM tuner is used. High-Q coils for 455kHz IF transformers. 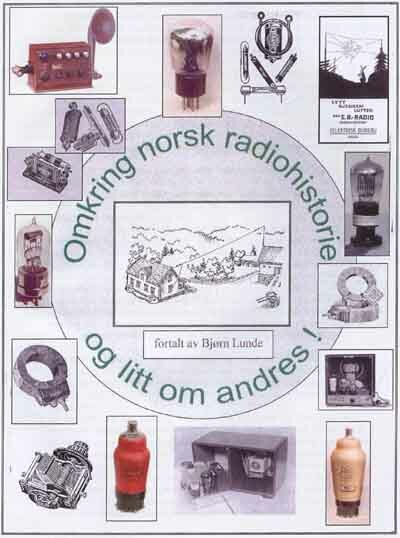 Stein Torp (LA7MI) mentions that Radionette used specially high-Q circuits for the first 455kHz IF coils. 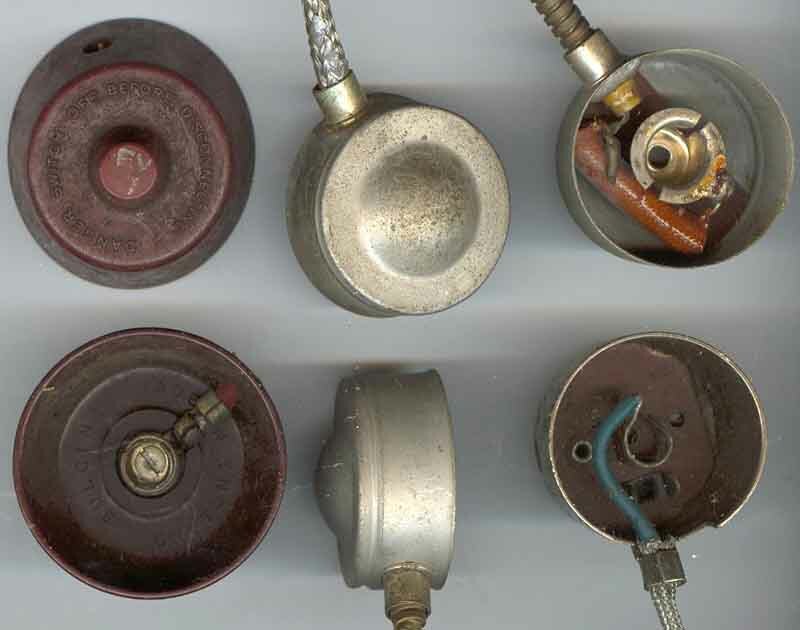 While normal Q-values found in transformers from Torotor and Philips are 100-110, the coils used in Radionette models between 1939-1955 (no exact info available) have a Q value around 200. This means 6dB higher gain and better selectivity. The coils were made at Salford Electrical Instruments Ltd, England, and he once received an offer from this factory for a planned homebrew receiver. See also applications by Edda Radiofabrik and Østfold Radio (Mascot). RIAA amplifier for using record player with modern stereo equipment. more info on page L2. Modifications on my BC-receivers are only on the rear side. Application of EF39/6K7 and RV12P2000 on low supply voltage. The gain is vastly improved when suppressor grid is connected to +B. It seems not to be a good idea to try triode-connection. 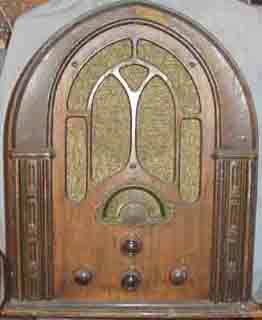 Atwater Kent model 137P BC-radio receiver. 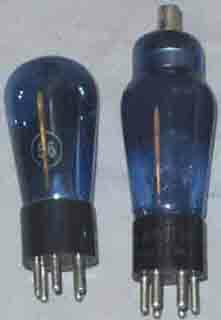 Note that 3 valves (out of 7) - type 56 and 58 - have blue coloured glass for some reason or other (not every 58 in this receiver are blue). 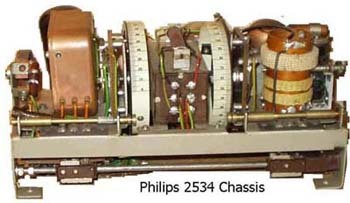 Zwischenbasis amplifier using 1/2-ECC85(6AQ8) in Philips B4N93A from 1959. 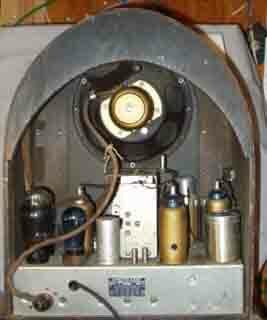 Although this amplfier is wellknown from mid-50's, it is not used by all manufacturers. The advantage of this VHF amplifier is that minimum noisefigure and maximum gain can be achieved simultaneously. Note the neutralizing capacitor C2. Reference page g34. 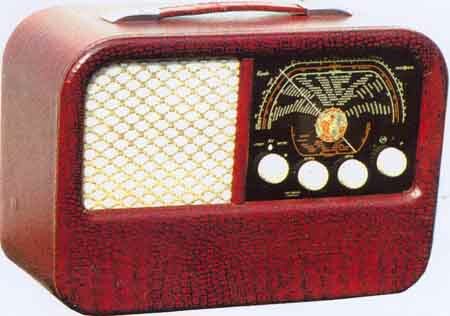 LA7MI mentions that they had a Radionette Symfoni 3D (= Studio 3D) BC receiver at home back in the 50's. The calibration was correct in the ends of the highest shortwave band (11-22Mc/s), but not at all in between. He borrowed a signal generator and discovered that the receiver was tuned with signal frequency below local oscillator in the upper end, but above it on the lower end. 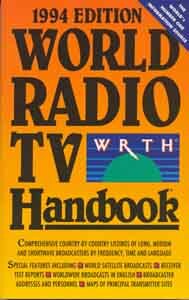 The attenuation of mirror frequency wasn't particularly good on the shortwave band. He removed some beewax and got the receiver trimmed more properly, and the alignment seemed to be much better over the band.